Our latest film featuring the ripping ladies at the Mt Baker Ski Area. The Selkirk Mountains in B.C. are known for being some of the snowiest in Canada. The Fairy Meadow Hut is situated in a snowy meadow surrounded by peaks, glaciers, tasty couloirs, and mini golf pillow zones. This is the story of getting far out, unplugging, and stripping down to what we all love to do most -- ski and sauna. A family of riders spending days on end together in massive amounts of snow at Mt. Baker Ski Area in Washington. Please enjoy this story of the Mt. Baker family, a dedicated bunch sending day after day. This is the story of getting soaked to the bone skiing pow, sleeping in the truck bed, and waking up to do it again. A collection of our favorite ski flicks with our favorite people. A recap of the 1st stop of the 2015 Subaru Freeride Series at Snowbird, UT. Men's Ski finals, on North Baldy. Congratulations to Grant Howard for win and all the athletes who came out to compete. We had a great time blasting around the resort with everyone and sleeping in the parking lot. Visible from Snowmass, CO, Daly peak has been tempting locals for a while. It's long approach turns a lot of people off from attempting to summit it, even in the summer months. This is the story of two skiers on a mission. With 12 beers and 2 bottles of cheap chardonnay, Mad Trees was welcomed to a ten day stay at the Buckhorn, Alta's employee housing. The timing couldn't have been better with two days of heavy snow eventually turning to a high pressure system yielding bluebird skies and settled snow. Our time spent living in the Buckhorn was an inspiring insight to the easy going lifestyle, and close camaraderie of the Alta faithful. Mad Trees had a great 13/14 season : from the fat 500" season at Jackson Hole to one of the coldest Vermont winters in 100 years, people were getting after it. 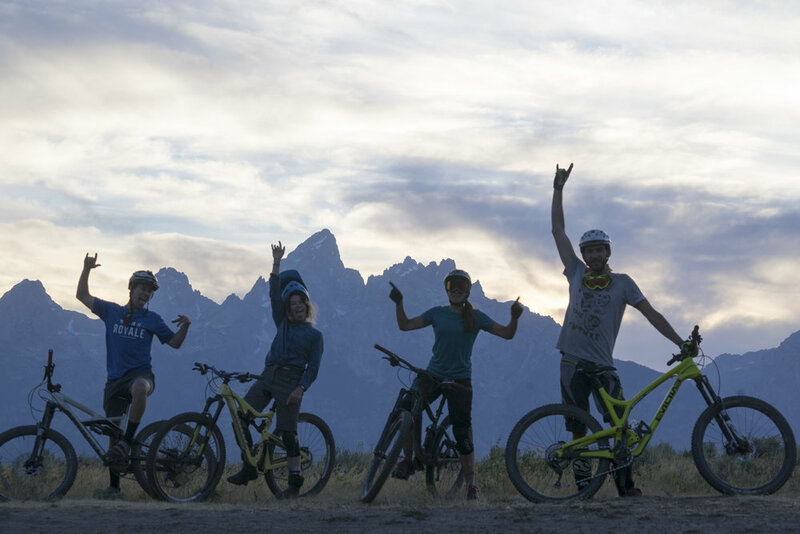 Enjoy this blast of shots from the Vermont gullies, Tetons, Little Cottonwood Canyon, and Kootenays. Want to know what it takes to be a ripping mountain biker? The secret, Bonnie reveals, is a couple donuts, some peanut butter and bread and a whole lot of speed. The Sunshine Coast in British Columbia is home to a destination bike park -- people from all over the world come to ride the shuttles at Coast Gravity Park. Everyone visits with high expectations, and none leave disappointed. Check out what we love about Coast Gravity Park. When originally published, this short caused a bit of a stir in the Vermont MTB community. Mad Trees built a small hit on a vintage trail in one of the more popular trail networks in the state and released a video shot on location. When the local trail builder and his crew saw the short, the familiar stress of building illegal trails on state land back in the day hit them hard and caused an internet frenzy. MTBVT.com posted an article fueling a much needed debate of a larger problem mountain bikers across Vermont are encountering. "We used to have expert trails that could take 6 years to learn to ride with style. Now we are building expert trails that 6 year olds can ride." While we're all for the 6 year old groms and get that you can't tear through vegetated slope sides without causing erosion, the VT trails are sure looking a little groomed for our tastes. So we're sorry for all the skidding, and it was never our intention to inhibit future trail building endeavors, we were just trying to drift in some fresh dirt and catch a little air. Enjoy. The Northeast Kingdom is Vermont's epicenter of bike culture. Local legend Knight Ide is an icon in the bike community, enabling people of all ages and backgrounds exposure to this amazing culture. This is his backyard. Bellingham, Washington is a hub for all outdoor activity. The trails are built to impress. Weekends here are characterized by a bounty of good people, meat, and the satisfaction of muddy, tired bodies. About twenty miles west of Seattle on interstate 90, the land changes from a cityscape to an understory of ferns and massive slugs. This is where the people go to ride. A montage of shots from the I-90 Corridor. Pollen is in the air, along with Alexander Chay as he hits the primo trails of Stowe and Essex, VT. Here are a few vernal shots as the crew transitions from a cold Vermont winter to bike season. Are these people even working? A study of balance in pursuit of the outdoors and income. An early Mad Trees edit filmed in the Northeast Kingdom of VT by Spencer Lee. Founded on the streets of Burlington, VT by a thick crew of University of Vermont students, Mad Trees first premiered at the UVM Ski and Snowboard Club's Homegrown Film Festival. A spring event where all students with Tuesday/Thursday class schedules showed up to watch ski flicks and drink tall boys in the campus amphitheater. This edit won the Best Powder Award in 2011, resulting in a free pair of goggles and an after-party on Henry Street. Since then, Mad Trees has grown into a movement : how to balance work and play when you are driven by passion.